John F. Kerry trashed the American military again last night at an Angelides campaign event at Pasadena City College in California. “I’m John Kerry, and I’m reporting for duty,” the Massachusetts senator in his acceptance speech while saluting the cheering crowd of Democratic delegates that packed Boston’s FleetCenter in 2004. He also said the Republicans do not have a monopoly on the flag and patriotism. …Or shilling for the enemy, or wanting to cut and run in war or treason. JFK, the voice of the democratic party, has outdone himself this time. JFK October 30, 2006. Nice! Just not the kind of history he had in mind! Michelle Malkin has more on JFK’s latest trashing of the troops. And, this man could have been our Commander in Chief?! Glenn Reynolds says John Francois Kerry is the gift that keeps on giving! American Thinker says JFK has his “Europeanization” Unmasked. Political Pitbull says you don’t say something like this unless you think it’s true. Sister Toldjah– and this man could be president. Right Wing News points out the real idiot. TigerHawk– Who says they have a contempt for the military? Who? 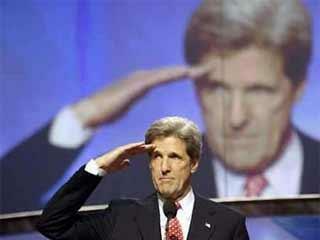 Tom Maguire– Kerry assures Americans they made the right choice in ’04. The Jawa Report– MSM in complete cover-up mode. The Anchoress– Swift boater needs a swift kick! STACLU has Kerry’s likely response. Honestly, I thought that “response” was a joke from Scrappleface or IowaHawk… It’s not! HAH! Carr bristles when he hears unfounded charges that the men and women entering the military are less educated, less affluent or less likely than other 18- to 24-year-olds to have alternatives to military service. The military has exceeded the 90-percent benchmark for recruits with high school diplomas every year since 1983, Carr noted. * Myth 2: The military tends to attract people with lower aptitudes. Recruits actually have much higher average aptitudes than the general youth population, Carr said. In fiscal 2005, 67 percent of recruits scored above the 60th percentile on the Armed Services Vocational Aptitude Battery. The test is designed so that the average young person will score 50 percent, he explained. But high achievement on the test isn’t new, Carr said. Sixty percent of new enlistees have scored at or above the 50 percentile — the military’s benchmark for recruits — every year since 1985. * Myth 3: The military attracts a disproportionate number of poor or underprivileged youth. In reality, military recruits mirror the U.S. population and are solidly middle class, Carr said. He cited a recent Heritage Foundation report that shows most recruits come from middle-class families, rather than poorer or wealthier ones. Patterns in recent years reinforce this trend, showing a slight dip in recruits from lower socioeconomic groups and a slight increase from upper-class groups, Carr said. Inner cities are actually the most underrepresented area among new recruits, Carr said. Both suburban and rural areas are overrepresented, he said. Texas Rainmaker has more facts for Kerry who is not only insulting but dead wrong! Question: If I could follow up, on the campaign trail, Senator Kerry was in Los Angeles and speaking to some students, saying if they were able to navigate the education system, they could get comfortable jobs, but “if you don’t, you get stuck in Iraq.” Can you react to that? What Senator Kerry ought to do first is apologize to the troops. The clear implication here is if you flunk out, if you don’t study hard, if you don’t do your homework, if you don’t make an effort to be smart and you don’t do well, you “get stuck in Iraq.” But an extraordinary thing has happened since September 11th, which is a lot of people — America’s finest — have willingly agreed to volunteer their services in a mission that they know is dangerous, but is also important. And Senator Kerry not only owes an apology to those who are serving, but also to the families of those who have given their lives in this. This is an absolute insult. And I’m a little astonished that he didn’t figure it out already. I mean, you know, if I were Senator Kerry — I mean, you’ve seen me, I say something stupid, I apologize as quickly as possible. And this is something for which he ought to apologize. Meanwhile, it’s probably reasonable to ask some of the Democrats — ask a Jim Webb or a Tammy Duckworth, both of whom are citing their military record — okay, what do you think about it, what do you think about this quote? Do you agree with him? He was your presidential nominee. And as for the notion that you can say this sort of thing about the troops and say you support them, it’s interesting. Yes… He definitely does! Will they get it?… Not likely!